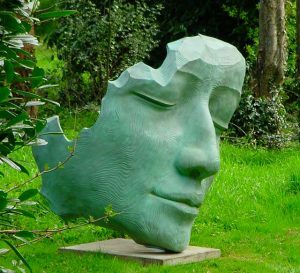 Our annual sculpture show returns to the stunning landscaped gardens in the heart of the South Downs National Park. We will be showing an amazing range of work by both new and established gallery artists. 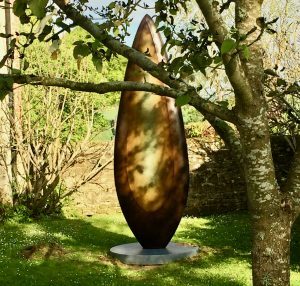 Dominic Welch will be exhibiting his fluid abstract pieces in bronze and Kilkenny Stone including Rising Form VI, his largest piece to date a soaring 2.7 metre bronze. 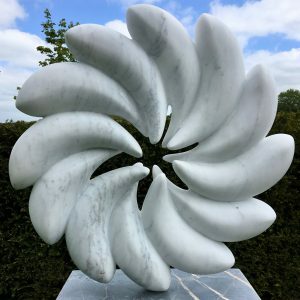 William Peers returns to the gallery with his abstract marble work which seem to defy gravity. Also exhibiting again after a long absence is Leonie Gibbs whose striding Pictish Queen stands over two metres tall and Marzia Colonna whose highlight is her mystical two and half metre tall Man and Bird We are also exhibiting innovative work in metal and stainless steel by Richard Farringdon, Miranda Michels and Claire Tupman and Olivia Ferrier’s bronzes assembled from cast twigs, feathers and other natural objects.